When Pamela Bailey, who heads the Grocery Manufacturers Association, announced in February that she will leave her $3 million-a-year gig, it came as no shock. After all, the lobbying group had in the past year lost some of its biggest members, including candy-maker Mars Inc. and Tyson Foods, the world’s second-largest producer of chicken, beef and pork. The organization is undergoing a “reinvention,” in the words of its spokesman Roger Lowe, and this week tapped Geoff Freeman, who runs the American Gaming Association, as its next CEO. The group will move from its downtown Washington headquarters into a smaller space across the river in the Rosslyn section of Arlington. 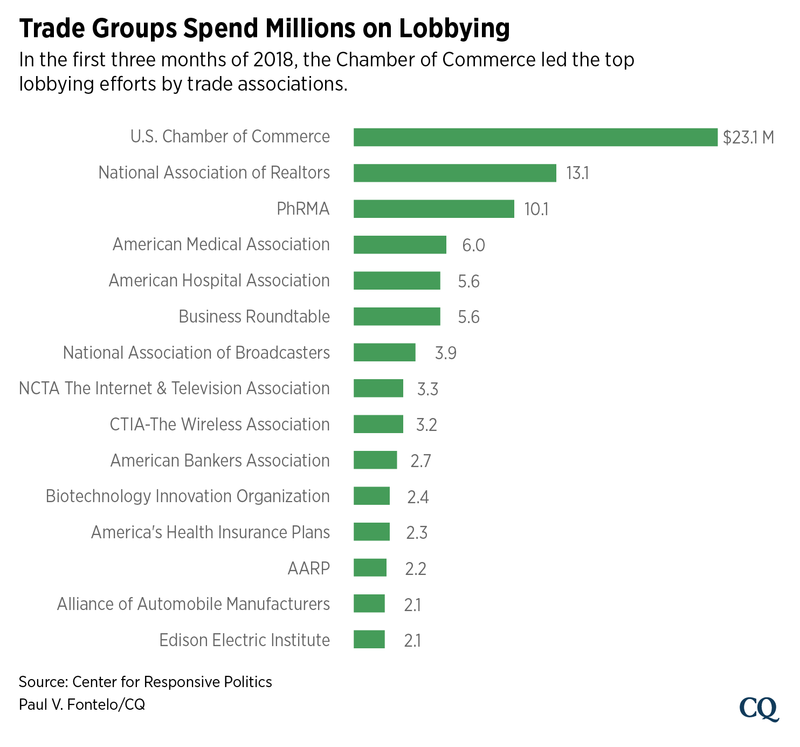 The turmoil at GMA, though unique in its magnitude, is hardly an isolated event as trade associations, traditionally the backbone of K Street’s lobbying corridor, find themselves in the throes of disruption. These multimillion-dollar organizations are clamoring for ways to boost membership, and sometimes even keep their doors open, as they work to stay relevant amid the political and policy uncertainty of Washington during the era of President Donald Trump. Associations and member organizations offer companies and professionals a platform to push policy proposals under one voice, and give their dues-paying members access to networking, continuing education and even, in some cases, involvement in a political action committee. But with overlap among multiple groups, some companies are applying a critical eye as they evaluate the benefit of their dues, which can top $1 million a year for big companies at a major trade group like America’s Health Insurance Plans or the Pharmaceutical Research and Manufacturers of America, known as PhRMA. “I do feel that the pressure on association leaders to consistently and, in a compelling way, create a value proposition that really gets those members to say, ‘I can’t afford not to be there,’ is just hard,” she added. The current political environment, mired in unpredictability since Trump took office and even more so in an election year, has helped spur big changes at some of the country’s most iconic associations, including those representing food manufacturers, big banks, oil companies, health insurers, wine and spirits, and nonalcoholic beverages. A number of high-profile, highly paid association chiefs have left or are on their way out, while some groups have lost significant members or are folding into other organizations — a sign that associations feel the dual storm of political turmoil and increasing pressure from their membership. “Some of it is driven by the change in the political environment,” said Juanita Duggan, CEO of the NFIB, an association of small businesses, who has spent most of the past three decades at the helm of various trade groups including the American Apparel & Footwear Association. NFIB went through a leadership change when it tapped Duggan in 2016. By contrast, some of Washington’s best-paying trade association leadership jobs are up for grabs right now. From the Archives: What’s Next for Seats of Retiring Chairmen? Bailey is leaving the Grocery Manufacturers Association, while Freeman’s arrival at GMA opens a vacancy at the gaming group. Former Rep. Cal Dooley is retiring from the American Chemistry Council. Craig Wolf is exiting the Wine and Spirits Wholesalers of America to run for office in Maryland. Susan Neely is leaving the American Beverage Association for the American Council of Life Insurers, where Dirk Kempthorne, a former U.S. senator, Idaho governor and Cabinet secretary, is departing after eight years at the helm. AHIP has tapped Matt Eyles to take over for Marilyn Tavenner, a former Obama administration official who’s leaving this month. And the American Petroleum Institute, the chief lobbying arm of the oil and gas industry, recently tapped Mike Sommers, once an aide to ex-Speaker John A. Boehner of Ohio, to be its chief executive. Sommers will succeed Jack Gerard, who steered the powerful trade group for the past decade as the price of oil went up and down. “I’ve never seen anything quite like it, where all these jobs have come open,” said lobbyist Sam Geduldig, a partner in the CGCN Group, which lobbies on behalf of companies and industry groups, including the Financial Services Roundtable. Trade associations, like all big businesses, have the overhead of a bureaucracy and the challenge of getting members to agree on policy priorities. They also play a crucial role that has taken on new importance with Trump in the White House: They can push for or against specific proposals while giving their membership some anonymity — like a cloak of safety-in-numbers at a time when the president has routinely called out specific companies on Twitter or in public remarks. The president’s focus against some corporations offers a tangible sign that the modern Republican Party, historically aligned with business interests, is no longer the old Chamber of Commerce GOP. And getting what an industry wants out of Washington is not as simple as writing a check. Some groups are looking to update their ranks for the new order. Top association management jobs in the past have often gone to former lawmakers like Dooley and Kempthorne, who are valued for who they know on Capitol Hill or in the administration and their ability to navigate Washington. Julian Ha, a lobbyist recruiter at Heidrick & Struggles, said that may happen less today. People who have already managed an association may make for more appealing job candidates, he adds, as was the case with Freeman as well as with Neely, whom he helped place at his client ACLI after she spent more than a decade with the beverage association. Some of the job openings at associations are the result of longtime chiefs reaching retirement age, which can have a domino effect as search committees look for experienced association professionals to fill vacancies. But as companies consolidate, membership in an association can shrink, and that can put revenue in jeopardy with a trade group. Some corporate chiefs have leaned on their lobbying groups to consolidate. “They’re asking, ‘Hey, is the juice worth the squeeze at all these different groups that may be working on the same things?’” said Moery, whose 8-year-old firm’s business was sufficiently strong that it sponsored an Indy 500 race car this year. In some cases, the answer is no. Mars, whose brands include M&M’s, Snickers and Uncle Ben’s, and Tyson Foods are among the 10 member companies that departed the Grocery Manufacturers Association in the past year. The lobbying group reported total revenue of $35.7 million in 2016, according to IRS forms, down from the prior year’s $ 38.3 million. The remaining member companies, such as Procter & Gamble and PepsiCo, want a strong lobbying voice on Capitol Hill and inside the executive branch as well as a platform for industry players to meet and discuss their common concerns, spokesman Lowe said. Membership dues provide the biggest part of the group’s annual revenue. “We believe and hope that once we’ve got the clear direction and path forward for the evolved and reinvented GMA, that some of the companies that did not renew their dues for 2018 will come back,” Lowe adds. Brad Figel, the top in-house lobbyist at Mars, said departing GMA was not an easy decision after more than four decades in the association. But disputes over food labeling, climate change and other policies made membership not worth the dues — or the time, he said. Instead, Mars has stepped up its involvement in niche groups, such as the National Confectioners Association and USA Rice, and focuses on aligning with like-minded companies to push specific policy proposals. 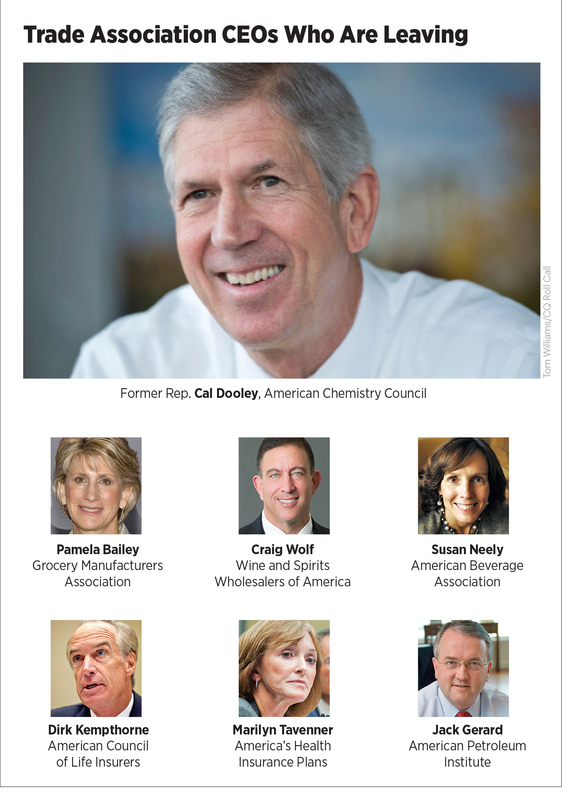 Dooley, a centrist Democrat who has been at the helm of the American Chemistry Council since 2008, said building coalitions is a role that existing groups should not cede to impromptu affiliations. “Associations are recognizing that we have to do a better job of building broad-based coalitions that can demonstrate the breadth and scope of the constituencies that would benefit from a particular policy that Congress could act upon,” said Dooley, who will depart at year’s end. During his 10 years running the council, Dooley helped the industry through an update of a 1970s regulatory law for chemicals and other substances. With support from the industry group and environmental organizations, the Senate passed the measure by unanimous consent back in 2016. While that landmark legislative effort happened before Trump took office, Dooley acknowledges that such a bipartisan accomplishment “would be very difficult” in today’s polarized politics. In short, the work is getting harder, not easier. The Financial Services Roundtable — whose membership includes American Express, Bank of America and Wells Fargo — offers an example of association consolidation. Tim Pawlenty announced earlier this year that he was walking away from his $2.7 million annual salary as the roundtable’s CEO to run again for governor of Minnesota, the job he held from January 2003 to January 2011. K Street expected the financial services group to put out a “help wanted” sign. Instead, the membership pushed for something more common in corporate boardrooms: consolidation. The roundtable will band together with another financial services industry group, the Clearing House Association, and the combined group will take on a new name, said Clearing House Association spokesman Sean Oblack. Greg Baer, who runs the Clearing House group, is expected to lead the new entity. Despite the challenges — internal and external — for trade associations, veterans of this slice of the influence world see their business thriving.